There is enough game variety and straight talking to keep me interested in ComeOn Casino. However, I wish it would come on and hurry up with all it’s downloading…Graphics are spot on for the majority of the games and, where there is music it is fairly pleasing to the ear. ComeOn Casino bonus play is frequent and, there are just about enough promotions and jackpots happening so as to ensure ComeOn Casino does not lose your attention. ComeOn Casino, based in Malta, boasts that they have the Highest European Standards and say "Being in Europe, means you have to pay attention (and a lot of money) to every single detail. And we do it well." ComeOn holds Malta's LGA license, issued on 13 October 2011 for New Entertainment Casino and the same license, issued 8 November 2011 for Microgaming Casino. ComeOn also holds an e-gaming license granted by the Government of Curacao for the CTXM Casino and Sheriff Gaming Casino. ComeOn Casino – What a Bonus! A simple, no nonsense casino that tells you up front – we don’t do the Queen’s English. Surprisingly, for a born and bred Brit like me, this wasn't offensive. I like the fact ComeOn Casino put their money where their mouth is and admit up front, we have players from all over Europe and our focus is on providing them with the best gameplay available. 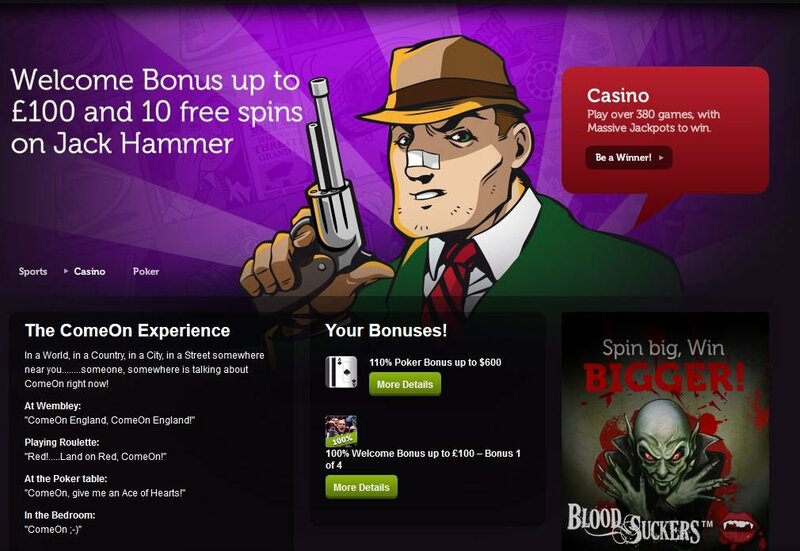 A real ComeOn Casino bonus is that they made your deposit with a 100% bonus. There are many varied progressive slots where you can win a huge jackpot from the comfort of your home. ComeOn Casino is also mobile and, you can claim all your bonuses, promotions and enjoy all your favourite gameplay whilst you are on the move. You can also make sure that you are available to play one, or even both, of the daily tournaments! 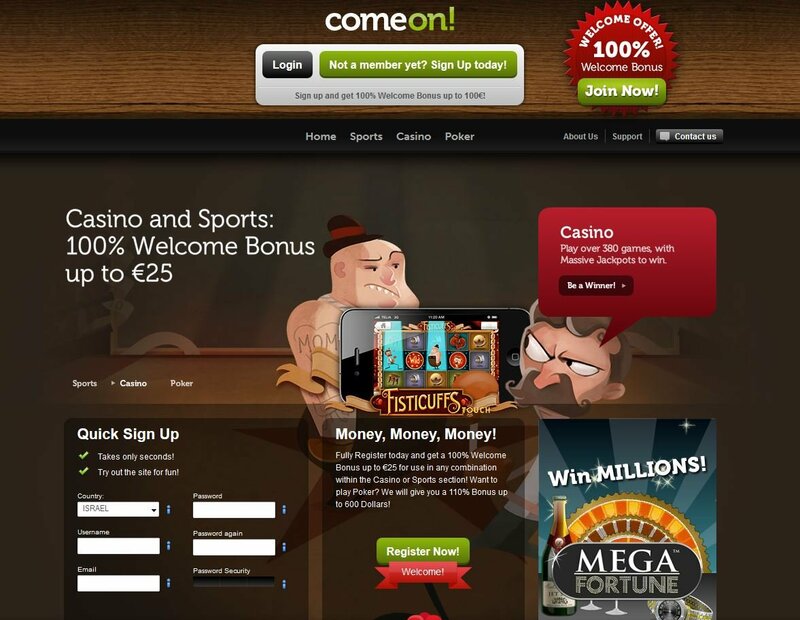 Information for UK players: ComeOn Casino's Welcome Offer is only open to new UK customers who are 18 years or over. Terms and Conditions apply. Prompt on line chat customer service with that extra mile taken to make sure your questions are answered and help is given as quickly as possible. To quote from ComeOn Casino themselves "Being based on a boring European Island, our support agents prefer to work 24 hours straight, instead of having a life. Live Chat, Email and Call Back Services are open for you around the clock. ComeOn Casino has a new single, out now. They say "You don't take several wallets to the shops, so why should you to your gaming site?" Come On offers you a Single wallet cashier system, so there is only 1 amount. And that is your money. No hassle. No confusion. No frustration." ComeOn Casino offers most payment methods in addition to their preferred method. ComeOn Casino is also mobile and, you can claim all your bonuses, promotions and enjoy all your favourite gameplay whilst you are on the move. For graphics on a Netent platform, they are not really very high end and, the table games have all been branded with the ComeOn logo, just in case you forget where you are and they have to send a search party out to get you! Graphics on their range of slots are cute and definitely get the job done. There are inspirational flashes of music here and there to enjoy as well. Black and White is one of ComeOn Casino's special games that definitely has some special music too. I would go as far as to say it was worth keeping an ear out for. They have ComeOn Casino Scratch Tickets that seem to work the same as going down to your local newsagents and buying a scratch card. ComeOn Zombies slot reel gives an air of dangerous munching on flesh and really puts the chills up your (by now) bare spine. 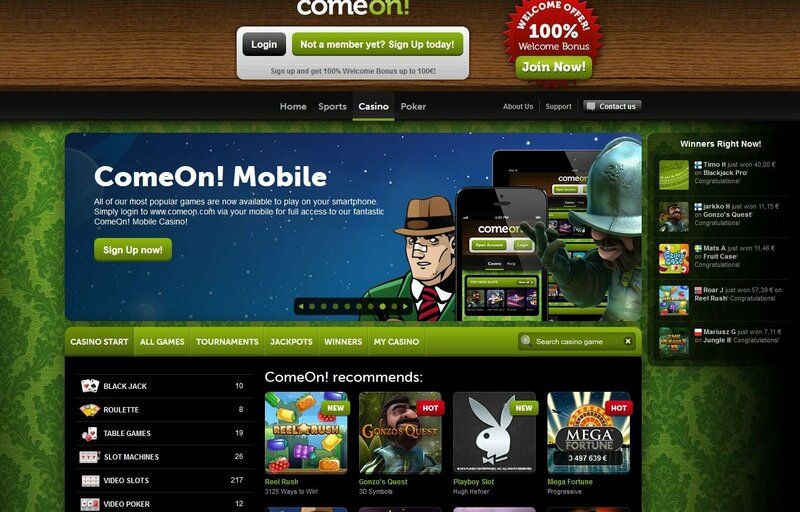 After doing some investigation I found that Comeon Casino offers games from Microgaming, Platech, NetEnt and others. This sounds like a great combination, and I would expect to see some leading games. I am on my way to give this casino a try.